What is the Halifax Art Festival? Back again this November is the 56th Annual Halifax Art Festival! 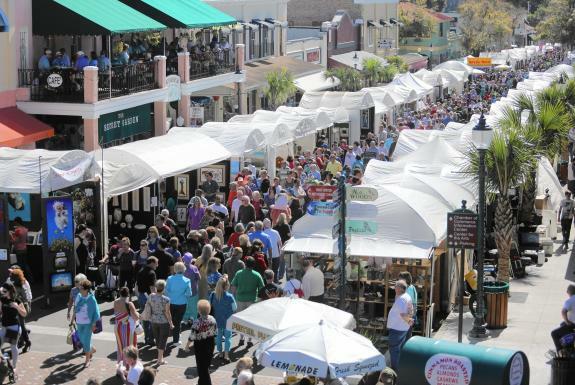 As the second oldest continual art festival in the state of Florida and named a top 200 festival by Sunshine Artist Magazine, the Halifax Art Festival attracts more and more visitors every year. This year, approximately 45,000 visitors are expected to attend! Art enthusiasts, students and families seeking a fun event all flock to the fest to view the works of 250 fine artists and craft artisans from all over the country. What should I expect at the festival? The event is broken into two main sections: the Competitive Fine Arts & Crafts section, which is juried and judged for prize money, and the Non-Competitive Arts section, which is juried but not eligible for awards. You can peruse a wide variety of oil and watercolor artwork on the riverfront, as well as ceramics, basket weavings, jewelry, home goods, clothing and so much more. Plus, there will be a Student Art Exhibit and Competition featuring some of the area’s most promising and profound artists that range in grade level from kindergarten through 12th grade. As part of the award given to the students, the winning art will be displayed at Daytona Beach’s prestigious Museum of Arts & Sciences for one week! Are there family-focused activities at the Halifax Art Festival? There’s something for all ages throughout the entire event! Beyond the awe-inspiring art, there is also an abundance of live entertainment, food and fun to be had at the festival. Grab a bite of festival food, or dine at one of the many fine bistros along Beach Street. Knock out your holiday shopping list in one swoop! Take the little ones (pre-K through 5 years old) to the “Little Van Gogh” tent, where they can create their own masterpieces for free. Or, groove to live music along the riverfront — this setting is art in itself! This premier Central Florida event is organized and presented by The Guild of the Museum of Arts & Sciences, and it benefits the museum — so you don’t want to miss out! The fun will take place on Saturday, November 3, from 9 a.m. to 5 p.m., and again on Sunday, November 4, from 10 a.m. to 4 p.m.
All of the action will be happening at the historic downtown Riverfront Park on Beach Street, between Bay Street and Orange Avenue. Parking is plentiful and free to the public. Come on down to the riverfront and experience an arts and culture event for the books! Find the perfect place to stay now!